Does the photo above sicken you? It sickens me. I have been rescuing animals, both wild and domestic, since I was a child. I’ve rescued field mice to horses, and everything in between. I’m allergic to cats, but in my lifetime I’ve rescued five of them. The last one, who took up residence under my house on a frigid January afternoon, is now a friend’s happy, healthy indoor cat. I look at the photo, and am enraged by how cruel and callous human beings can be. I have been a wild bird rehabilitator for 25 years. 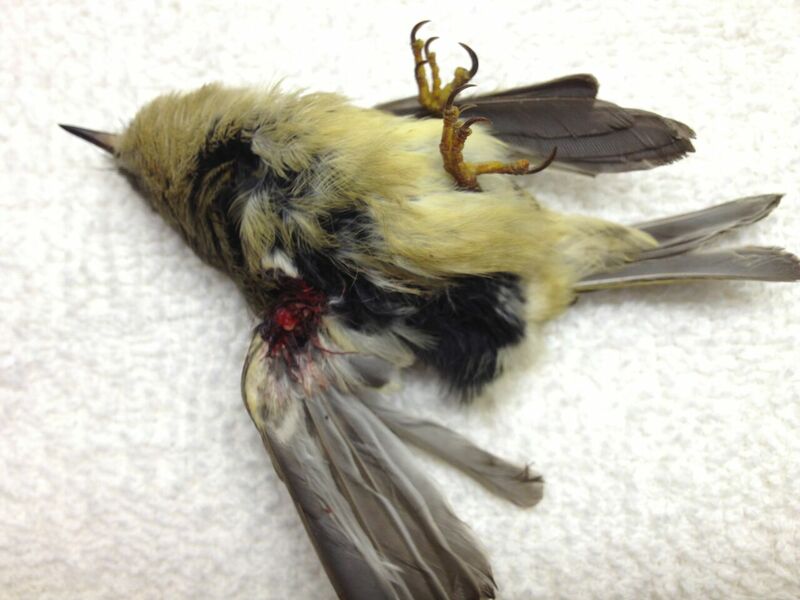 I have received countless numbers of wild birds mangled and/or killed by outdoor/feral cats, such as the Orange-crowned Warbler pictured here. Is it the fault of the cats? No: it is the fault of their owners, their former owners, or the Trap-Neuter-Release crowd. I look at these birds, and am enraged by how cruel and callous human beings can be. Can your hearts be so species-specific? Can you talk about how much you love your cat, and ignore the shredded bodies of the birds it mutilates? 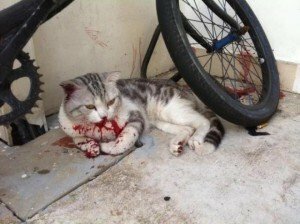 Can you convince yourselves that your cat does not kill birds, when statistics show pet cats only bring home 23% of their kills? If that’s the case, then let me show you what happens to outdoor cats. If you love your cats so much, why don’t you protect them? Recently I received an email and these two bird photos from Veronica Bowers, founder of the songbird rehabilitation center Native Songbird Care and Conservation in Sebastopol, CA. She had just received four cat-caught songbirds within 55 minutes. All had to be euthanized due to the severity of their injuries. Outdoor/feral cat people: are you upset I posted these cat photos? How lucky you are that you can delete them with the push of a button. It’s so much easier to delete a picture than to end the life of a mortally wounded cat-caught bird, like this Downy Woodpecker … who is alive, but not for long. There is no moral ambiguity here. Cats are domestic animals highly susceptible to a host of diseases, many transmittable to humans. They are safer and live far longer indoors. If you love cats as much as you say you do, then stop playing Russian Roulette with their lives. I think what sickens me even more are those spineless and heartless “bird lovers” who whine and whine and whine and whine and whine and whine about the problem but will do absolutely nothing to fix the problem. I shot and buried hundreds of these invasive species vermin cats on my lands over 5 years ago. The eradication of them so complete and effective in my area that I’ve not seen even one cat since, where before there were literally hundreds of them gutting-alive and skinning-alive all the native wildlife. The wildlife has rebounded better than I could have ever hoped for or expected. I estimate about one-returning or one-never-seen-before native species of animal has been arriving on my lands PER DAY since every last cat is dead and gone over 5 years ago. That’s a LOT of species that cats annihilated during their 2-decades infestation in the area. Sorry, you’re not going to get out of this situation without getting some cat-blood on your own gloves, and that’s a fact. (Wear gloves to protect yourself from the 3dozen+ diseases that these vermin cats are spreading to humans.) Get started! You only have about 90,000,000 of them to destroy this year. Whine all you want, but nobody is going to destroy these cats for you just because you whine like little children. It’s time to grow-up into responsible and respectable adults that know what it takes and will actually do what it takes to preserve the natural world from an invasive-species predator. That means killing ALL stray cats by ANY means possible. There’s no other way now. Grow up from being the ineffectual whiney children that you are, or lose your world and all animal life on it. Your choice. Before you pull that trigger, THE MIGRATORY BIRD ACT TREATY protects BY LAW & with a HEFTY FINE, all but 3 “invasive species”, the House (or English) Sparrow, the European Starling and the Rock Dove (city pigeon). The HOUSE SPARROW & STARLING were introduced & released by HUMANS in 1860 in “New York’s Central Park” to complete ALL the birds in “William Shakespeare’s sonnet’s”. By the 1920’s they’d made it to the west. Good catch, Rick! It’s the zombie lie that will not die! How right you are! I too am a lover of wild birds of all types. As a matter of fact a Coopers Hawk has taken it upon itself to become friends with us! This bird of prey will come down from its nest about 110 ft. high in a live oak tree to a nearby branch and “warble” at us for 5-10 minutes. Why it has chosen this behaviour is beyond us, but the ability for it to allow us to admire it’s beauty and speak to it is indeed a gift. The songbirds are ever so slowly reappearing. Soon, I will start placing out my feeders for them to enjoy and for us to admire them. Being in the location we are there is no fear at all of the hawk and other birds of prey feeding on them as the fish, squirrel and rabbit population is quite good. Good enough that a Bald Eagle was seen less than a mile from my home with a trophy bass in its talons. Eradication is both impossible and highly unlikely. All I can do is keep these (place cuss of your choice for them here). as far from my property as posdible. To The Voice … perfect example of how destructive cats and their crazy enablers can be. Glad you can finally enjoy the wildlife meant to be there. Reply to ‘The Voice’–eradication will certainly prove difficult and costly, but it is NOT impossible. There are 41 peer-reviewed scientific studies linked to the IUCN website that described successful eradication programs against invasive cats, foxes, goats etc. One such study conducted in NW Mexico, which documented successful elimination of feral cats from 16 of 26 islands by local communities, includes ‘how-to’ instructions for carrying out eradication programs against feral cats. One strategy which has yet to be tried is placing a bounty on them. Make it profitable enough and people will actively eradicate this deleterious invasive predator, and it WILL work. Proof? In 1880 the US govt. place a bounty on wolves, and in a mere seven years nearly a million of them were exterminated. At that time people weren’t nearly as numerous, urban environments weren’t nearly as extensive, and firearms and other hunting gear weren’t nearly as sophisticated as they are now. Primarily due to bounties, wolves went from being the most widespread large land mammal on two continents to the endangered list. I DON’T defend what was done to wolves–it was in the vast majority of cases unnecessary. I mention the example to prove that bounties WORK, and they’ll work if applied to invasive predators just as much as natural ones. Thank you, Nature Advocate. My son and two of my grandchildren live in Australia. People who wanted to sleep were probably annoyed at Paul Revere, too. You’re a voice crying out in the wilderness–and you aren’t alone. Thank you, John – I appreciate it. Hope it does some good. AMEN! Sing it sister! Our local Audubon group has a “Cats Indoors” booth at a nature center festival this weekend. I’d like to urge each of your readers to get active about the issue. Talk to your neighbors, write a letter to your newspaper and one to your local representative. 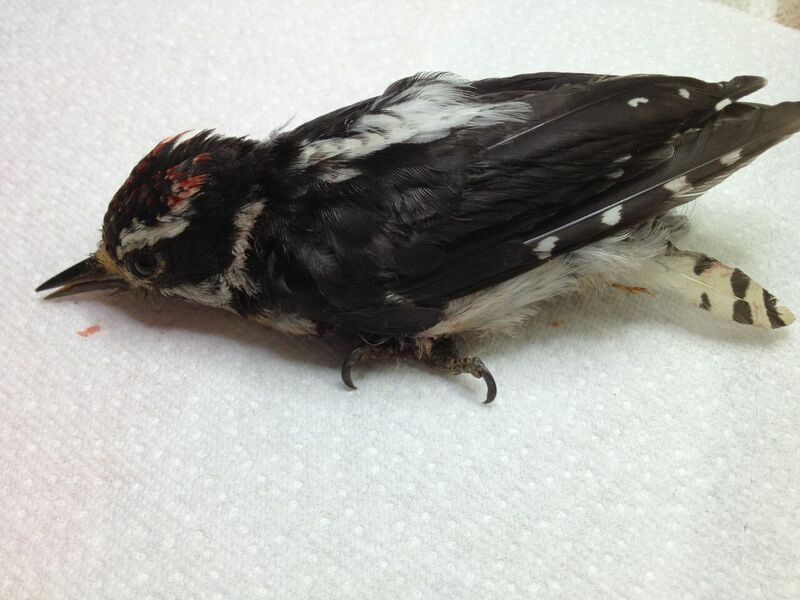 Complain to animal control if their practices are harming wildlife. It only takes a couple of people to support each other which then starts the conversations. It would be wonderful if TNR actually reduced the number of cats, but now we know that it doesn’t work out that way. We need a societal change of attitude about the place of wildlife, humans, and pets. I’m with you, Mikal … how great of your Audubon group to have a Cats Indoors booth. We need laws on the books … that’s what will help the most. The is one of the very best articles that I have seen on the issue of roaming cats. 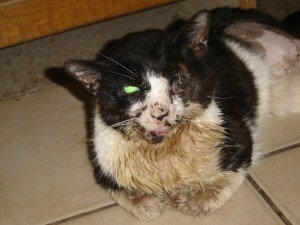 You need to present this to each and every municipality that pats itself on the back for “saving” cats through encouraging and allowing TNR of a domestic predator. The supporters of TNR and roaming cats should have to support wildlife rescues financially and volunteer their time helping to euthanize the little ones lucky enough to be brought in to have their suffering, cat-shredded bodies put out of their misery. I have always said that those who are allowing cats to roam are directly responsible fo the deaths of innocent, healthy living beings whose only crime is that of not being a domestic pet. The only thing I will say about Nature Advocate’s comments is they’re one more reason why people who love cats should keep them indoors. And we ALL see how well that totally ineffectual “cats indoors” whiners’ campaign is working, don’t we. You will find that it is 100% ineffective to try to discuss this with any cat-advocate. Do what I did after 15 years of trying to reason-with and educate the ineducable (at the loss of THOUSANDS of native animals that their cats tortured to death on my lands). Ignore every last thing that every last cat-advocate might ever say and you too will solve a centuries’ old problem PERMANENTLY in less than 2 seasons of your time, for a cost of only $0.003 (1/3-penny) to $0.04 per cat. Cat-advocates ARE the problem, they can’t be any part of the solution. If you include them in the solution or depend on ANY of them to do the right thing then YOU WILL FAIL. They now deserve and require the EXACT same amount of respect and consideration as they have shown and given to every other life on this planet, animal and human included, that being — ABSOLUTELY NONE. Then and only then will you solve this global ecological disaster that they created and are hellbent on perpetuating. Licensing and laws do nothing to curb the problem. If cats are required to be licensed then these lying, deceitful, manipulative, and conniving cat-lickers just stop putting collars on their cats; as they did by me. And they won’t even bother getting them micro-chipped, especially not that. They want absolutely nothing that can hold them legally accountable for their actions and the actions of their cats. We’re not talking about the topmost responsible citizens of the world, you know. They don’t want that responsibility of what they and their cats have done coming back on them. If they had even one iota of a sense of responsibility and respect for all other lives on this planet we wouldn’t even be having these discussions. Any non-native cat that is allowed to illegally hunt our native wildlife where I live then in turn gets hunted until dead. No delays, no excuses, NO EXCEPTIONS. That’s the very best way to keep these invasive species vermin from destroying any more native wildlife or spreading any more of their 3dozen+ deadly diseases to all other animals and humans. They had annihilated all the wildlife on my lands for 15 years, until on advice of the Sheriff I shot and buried every last one of hundreds of their vermin cats for them (AS-IS THE LEGAL RIGHT OF EVERY LAND-OWNER). 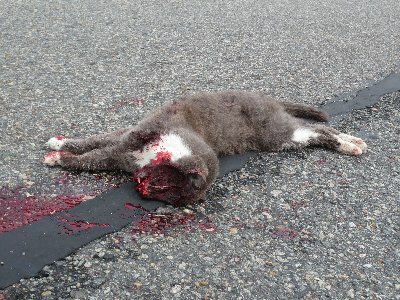 Collared or not — for you MUST destroy ALL stray collared cats as well, they are the very source of every last feral cat. If you don’t destroy them too then you have done NOTHING to solve the feral cat problem. Guaranteed. All the cat-lickers by me told me for over a decade that all their “pet” cats were sterilized. But upon inspection during shooting and burying hundreds of them, NOT ONE of their cats was sterilized. Cat-advocates and cat-owners who let cats roam free are manipulative and deceptive LIARS — one and all. I don’t see anyone dumping cats where I live anymore. They don’t even adopt more than can be kept under lock & key 24/7/52. When driving through the area I don’t see even one cat on anyone’s doorsteps anymore. I always keep an eye-out to see if there are more free-roaming cats that will have to be shot. And if I’ll have to leave fish-oil trails on all the roadsides again, leading right to my IR surveillance system and laser-sighted rifle. 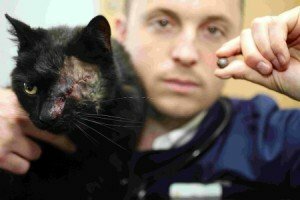 The eradication of these vermin was so complete and effective that cats are non-existent from my area for over FIVE years now. Not seen nor heard a single one. So much for that cat-lickers’ oft-spewed and manipulative “vacuum effect” deception and lie too, eh? Leaving ANY of their invasive species cats outside in my area means certain death for their cat, its further existence can be counted in hours. You’d think everyone else could learn from this simple lesson. The quickest way to solve an unwanted animal and irresponsible pet-owner problem is to let everyone know that you will quickly and humanely destroy every last one of their unwanted, uncared-for, or unsupervised animals for them. They either grow up fast or, far more plausible, dump their animals elsewhere to become someone else’s problem. “Nature Advocate,” we already banned you from 10,000 Birds before when you were operating under a different pseudonym. Please don’t make us do it again – you’ve said your piece, move along. Oh Buddy, you are preaching to the choir. As a Licensed Wildlife Rehabber for almost 30 years (Lord!) I finally became exhausted trying to kindly educate our “domestic cat owning neighbors”. My husband & I used to live trap their beloved kitties & take to Animal Control (interesting fact, of all the cats we have trapped only ONE CAT LOVER paid bail to free their precious pet!) NOW, when ANY cat crosses the property line, we send out our 3 cat hating HOUNDS! The cat mentality is “Well cats kill birds, reptiles,etc.” Well, DOGS KILL CATS! We have counted over 75 bird species on our property this spring, all bringing their new babies to feed on the property which we have set up to support the dwindling indigenous wildlife populations. BOTTOM LINE: Our species can live without the domestic cat. But our species CANNOT live without the indigenous wildlife which supports & sustains the Planet! The self proclaimed “superior species” first mistake was separating from ALL that is nature. TO ALL WHO DO NOT KNOW; the domestic &/or feral cat is NOT classified as wildlife! @nature advocate…. Do you write anything different in any of your comments ? Ever? Yes, 5years no cats-dead-gone-none on your land -you hate cats-you will kill any cat you see -we get it!! Really! I have to say, I respect Nature Advocate’s passion on this topic. Such fervor is usually reserved for the “cat lickers.” I’ve read hundreds of comments and replies to articles like this one- or the story about the vet in TX who shot the tom cat with a bow and then posted the picture on FB… the replies to that article were nothing short of terrifying. Calling for HER to be shot, comparing her to Dahmer or Gacy, etc. Anyway, it is a debate that evokes a LOT of emotion in people. And I certainly agree with Nature Advocate that there is no reasoning with people who simply will not recognize feral cats as the invasive and incredibly destructive nuisance that they are. TNR, even if effective (and it is plainly NOT), would remain an undesirable “solution.” It would seem as though we are simply expected to accept the notion of feral cats freely roaming every neighborhood as just an inevitable and unavoidable by-product of life in suburbia. That is CRAZY- and I do NOT accept it. 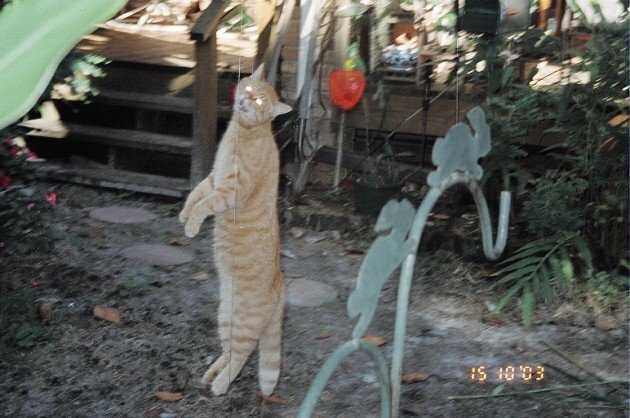 Unfortunately, as long as TNR remains the approach in my county, I feel that eradicating cats trapped on my property (as humanely as possible) is my right- as well as my responsiblity- to exercise. Image the outrage IF feral dog packs were treated as the cat TNR program is!? People would scream “RIDICULOUS”! The COLORADO CAT RESTRAINT LAW should be implemented in every state. Which includes mandatory spay/neutering, licensing, cat owner responsible for containing cat on their property & restrained off property. Cory, and we have YOU to thank for the last 10 million birds that were destroyed by cats, because you are JUST that immature and spineless to not publish the 100% solution to the problem. Go climb back under your mommy’s bed. Marc, apparently you are as well versed in cat-lickers’ lies and deceptions as I have become. Thanks for actually solving the problem, and not being part of the problem by evading the issue of destroying every last free-roaming cat. If more people like you existed (those who actually know how to respect and preserve all the native wildlife), then I won’t be forced to shoot more cats on my own lands. Though, since not seeing any cats for over 5 years now after implementing those solutions, the probability of that is minor, the possibility still exists. Should that ever happen — see a cat shoot a cat, and the problem is quickly reduced to zero cats yet again. At least YOU get it. Thanks. I’m with you, Lori, and thanks for your comments. We need to make TNR illegal, but we’ll never get a sweeping Federal law. It’s going to have to be town by town, county by county. Marc, I agree with you. Three of the five cats I rescued I trapped on my land, and they were such a mess I had them euthanized. I’ll break my own vow and respond directly to Nature Advocate: your approach is whining on steroids. You rant the same thing over and over, then pat yourself on the back for getting rid of the cats on your own land. Good. What will you do next? Spend more time on the internet calling people like Corey – who lives in an urban area, does not own a gun, yet does everything he can against the outdoor/TNR people – names? Stop the name-calling and actually do something. Pack up your night scope and hire yourself out to people who want to get rid of cats on their land. If that’s your solution, then don’t rest on your laurels in the middle of the war. @Suzie: I’ve banned Nature Advocate from commenting any more. If he comes up with another assumed name and starts commenting again please don’t approve the comments. Is that why he changed his name? I remember first noticing his posts under the name “Woodsman” or something like that. Then “Nature Advocate”, and more recently I think I’ve seen “TNR Researcher” posting with very similar attitude and vocabulary. He might have a few other aliases too. The only person on the conservation side who’s as psycho as a lot of the cat side are, to the point that I almost suspect him of being a False Flag operation, a cat supporter posting outrageous anti-cat items to discredit the conservationists…. Thanks for bringing this up, Susie – imagine if we could get that law on the books all over the country! To Joshua Rose–is it ‘psycho’ for this individual to sound the alarm about this environmental scourge (one of many)? He’s telling the truth, and he backs up his arguments with facts. And he’s right. Hand-wringing or whining on the internet won’t help. Fortunately in my state (AK) releasing domestic animals into the wild is illegal, and it is lawful to shoot domestic animals found harassing or harming wildlife. But the mewling simpletons who advocate TNR in the Anchorage basin and the Matsu Valley like ‘Mojo’s Hope’ and ‘Clear Creek Cat Rescue’, funded by PetSmart and affiliated with ‘Alley Cat Allies’ are pressuring local politicians to pass ordinances allowing release and establishment of feral cat colonies. The only thing standing in their way (other than a few biologists such as myself) is our sensible state statues prohibiting release of invasives. ‘Woodsman’ aka ‘TNR Researcher’ aka ‘Nature Advocate’ should not be silenced–he should be encouraged. Understood, Suzie…gotta add though that this individual has every right to be alarmed, and I believe that’s what moves him to resort in ‘intemperate language’. Been guilty of this myself, on occasion. I was banned from the ‘Alley Cat Allies main (Bethesda, MD) FB page and all my articles and photos of cats destroying wildlife were removed. I admit I don’t feel particularly repentant about that. But I do agree if we don’t do more we’re gonna lose this fight. Our opponents have corporate funding. Becky Robinson pulls down six figures a year and her stooges work part-time and/or for minimum wage. Or for free. Is it perhaps possible to devote a page here to discuss actions private individuals can take to more directly oppose these misguided and destructive people? There’s a lot of helpful information out there. One of the IUCN-referenced scientific studies included a ‘how-to’ section for eliminating feral cat populations. Perhaps this information can be adapted according to different local conditions (political and legal as well as geographical). Such a page might provide a means for folks like woodsman to make positive contributions toward combating this scourge. He does have some good information. If he were encouraged to offer the benefit of his experience, he might help us develop means for taking more direct action. And by that I don’t mean just shooting cats (although I won’t rule it out). There are sneakier methods. There are all manner of actions, including legal and political, whereby we can push back against the cat-hoarders and make their destructive ‘hobby’ less convenient for ’em. For example, I see lawsuits as an underutilized means of going after cat-hoarders and their organizations–including ASPCA chapters that promote and/or engage in TNR. Another example was when you advised a person to take trapped cats to an animal shelter far from the trapping site, so it’s more difficult for the hoarder to get ’em back and re-release them. And I think there were a lot of city/town council and county board of supervisor meetings where these cat-hoarding cretins showed up in mobs and we were underrepresented or not present at all. I kind of compare those of us who value biodiversity in the face of this threat to JRR Tolkein’s Ents. They spent days going over all the information they had to make up their minds about–and then they exploded. It may be, as old Treebeard observed, that it’s easier to shout ‘Stop!’ than to do it, but in the end we still have to do it. Or there’ll be nothing left but cat-feces. Great ideas, Fred! Will PM you. I wish to add an even more extreme example of successful eradication–one which would seem almost beyond belief. I refer to the Rocky Mountain Locust, a large grasshopper than once inhabited much of North America, particularly the West. These locusts formed immense swarms–some the size of the state of California. And when they swarmed they ate everything in their path, even the clothes off people’s backs. Where are they now? They’re extinct. Faced with large-scale destruction of crops and possible starvation, the US government placed a bounty on locusts–up to 50 cents a bushel-basket during peak swarm seasons, less at other times. Thus the insects were finally reduced to such small remnants that farmers were able to locate and plow under the few remaining areas where the locusts deposited their eggs, and the species was wiped out. 60-85 million feral cats may seem a daunting number, but the locusts swarms were orders of magnitude greater–and they were exterminated. The threat feral cats pose our increasingly endangered native fauna assemblages, to say nothing of the increasing zoonotic threat they pose to our own and our offspring’s health, may be more insidious than that posed by a swarm of locusts blotting out the sun, but the threat is no less deadly. Will it be difficult? Yes. But not impossible. And the alternative is what–TNR? That doesn’t work at all. It exacerbates the problem, which is what the cat-hoarders want. Ultimately that “alternative” will leave our children and grandchildren with a world that’s little more than a giant litter-box in which they’ll only be able to see Rock Wallabies, River Otters, Fence Lizards, Gala Parrots, Green Tree Frogs and Yellow-headed Black Birds in picture books about extinct animals. Great point, Fred. It’s definitely doable, although there weren’t a whole lot of people screaming about how cute the little … what’s the equivalent of “fur-children” when it comes to locusts – were. The people who fight for cats all seem to be incapable of understanding history, biology, or looking at the current big picture. You’re right in that legal channels, or taking a local matter into one’s own hands, are the only solutions. Exoskeleton children? Hexapod children? Tobacco-juice children? Heh. Point is folks were of necessity concerned with their children’s well-being and survival. They would not have seen the loss of a child as being no worse than loss of a cat, and would have regarded the modern imbeciles who think like this insane. And they would have been right. OOF. You HAD to bring up that ‘fur-children’ thing. That got me to remembering ‘furr-ever homes’ and all the other sickening nonsense these cat-hoarders coo and gurgle at each other on their websites, and it’s trying to make my breakfast come back up. Well, my coffee–haven’t had breakfast yet. And I SUBJECTED myself to their bilious, maudlin twaddle by visiting their sites. I’m probably scarred for life. I’m putting in for hazardous duty pay. Wait–nobody pays me for this. Foiled again! So people mourn the loss of a gnat or a fly? No, so you know why? Because they are a kind of plague. Cats are also a plague. Let’s face it, cats are dirty, disgusting, people hating rodents that torture and kill so many other animals that they destroy ecosystems and wipe out entire species. Why people think “fluffy” is so cute I’ll have no idea. They’re narcissistic sociopaths that have somehow fooled the majority of humanity into providing for them while they don’t even love, listen lorngave any respect for people. Yet we stuff these fluffy faces full of food so they can kill more animals. Looking at dead cats actually gives me great pleasure because it’s one less rodent destroying the planet. what bothers me is this talk about “domestic cats” being somehow better than feral cats when they aren’t. Of anything they’ve just learned to be more manipulative and annnoying but their impulse to destroy, wreck, mame and kill are still there. As far as I’m concerned cats rank lower than flies and gnats and should be killed at once on site. I don’t believe in torture – after all that’s inhuman. But I believe the world would be a much better place without these feline scums of the earth. The only good cat is an euthanized cat!